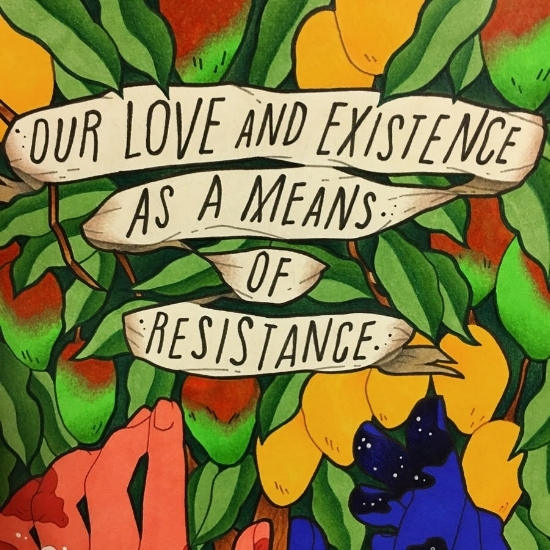 Seattle based illustrator and tattoo artist Raychelle Duazo creates pieces to represent the marginalized, pieces that bring people’s stories and memories to life. Her choice to actively represent communities like the queer community, the Filipinx community, and womxn (communities that she is a part of) bring visibility to these underrepresented, peripheral groups. Raychelle’s illustrations have been shown around the US, she’s worked with Amplifier and on campaigns such as March for Our Lives and Democracy Starts With You, and she is a tattoo apprentice at Osprey Tattoos in Seattle. It’s a choice to uplift queer brown people and put them at the center and Raychelle does so with grace and power. I started an Instagram about 6 years ago to document my travels, but I would also post images of my work, particularly collages and sketches from my journal. I posted them pretty consistently, and a lot of people would ask if I made or sold zines, illustrations, and prints, and I started to consider it seriously whereas before, I didn't think people valued my work. I began to make more original illustrations that I would post consistently and made prints of those as well. After a while, a lot of people would ask me if I did commissioned work, and that's how I became known for specializing in portraits. Around the same time, I started to get more heavily tattooed, and I really enjoyed the process of healing my body and seeing myself as beautiful, and getting tattooed played a big part in that. Because I really loved the aesthetic style of tattoos, I began to model my illustration style after tattoo art, and folx noticed and would mention that I'd make a good tattoo artist. I've been interested in art since I was a kid. Drawing and coloring occupied a lot of my free time when I was younger and even now. I used to check out books from the public library to copy images from (as reference photos), and that helped me practice and get better at drawing. My mom noticed that I liked art and would find art contests in newspapers and magazines for me to enter; she even signed me up for summer art classes when I was 10! What are your artistic specialties and what is your favorite medium? My artistic specialties include: portraits, floral / plant work, color work, and typography. Truthfully, marker & pen illustration and tattooing are at a tie for favorite medium. How do you portray activism in your work? I'd like to think I portray activism in my work by actively choosing to illustrate marginalized communities of which I am a part, including the queer community, the Filipinx community, and womxn. I also intentionally take on tattoo clients that have tattoo ideas tied to their culture and identities. When I take on commissioned illustration work, I choose to work with POC, organizations that help represent these same communities, and in general, people that might not otherwise have a lot of visibility with themselves or their own work. I'm most passionate about bringing people's stories and memories into my work; I think a lot of what art does -- art on paper, on your skin, wherever -- is about storytelling and preserving ourselves and what we're about. We want to show the world who we are because we're people who aren't seen often, if at all. I know for myself, it is crucial to see myself reflected in the world, in pop culture, in media, in order to feel that I have a place here. To feel good about myself. And I want other people to feel that way about themselves too. How important is diversity, inclusivity, and representation in your work? As I mentioned earlier, diversity, inclusiveness, and representation are foundations of my work. If I don't do it for people who aren't seen, what am I even doing? And that's the thing -- it is a choice to be making this kind of work. I don't necessarily have to illustrate queer brown people; I could be harboring a lot of internalized racism, internalized homophobia, and choose to illustrate and make art about things that have nothing to do with who I really am. But it will always be queer brown people that take center stage in my work because we deserve to see ourselves uplifted and celebrated. What are some of your favorite pieces you've created? Exhibits you've been a part of? A lot of the commissioned work I've created for Amplifier definitely is high on my list of personal favorite works. I've worked with them on three campaigns now (March For Our Lives, Power To The Polls, and Democracy Starts With You), and I feel my pieces with them have been particularly polished, direct, and clean. Works that I created for myself, titled, "The World (Siya)," "Kahit Ano (Para Sa'yo)," and "OPEN" are some of my favorite pieces also. I would say my favorite shows that I've been a part of took place in different states around the country (so I wasn't able to attend them), but my favorite local shows had to have been "HIGH BLOOD," "BLOODLINES," and "Sea, Still," put on by The CultureShock Collective. When I began modeling my illustration style after tattoo art, I had a lot of people notice that my aesthetic changed. One of these people was my friends who I was in a comics collective with (Sarah Rosenblatt). 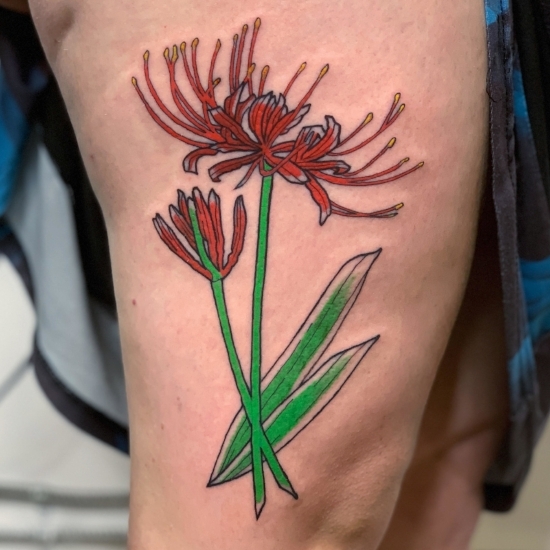 She would often get tattooed at Osprey Tattoo (where I work now) because the crew was all queer; one day, she heard the owner was looking for a new apprentice, and I went in to interview for the position. It sort of just fell into my lap, as everything seems to these days, and I began tattooing skin about 2 months in! How does it feel to have your tattoos on people, knowing your pieces will be seen and shared on their journeys? Frankly, it feels unreal to be tattooing people. I actually never thought I'd enjoy it as much as I do, but so many things about it are incredibly gratifying to me personally. I think seeing people's reactions once we're finally finished with their tattoos is amazing; it might sounds a little corny, but their excitement and enthusiasm upon seeing this permanent art on their bodies really does leave a lasting impression on me because I know how important tattoos are to our personal healing, our identities, and how we see & understand ourselves. Seeing that in other people, this emotion that I've felt myself after getting tattooed, is so rewarding. Especially so since it will be with them forever! What are some of the most meaningful pieces you've created? Lately, it seems like every tattoo that I do is my favorite. It's hard to choose just a few. But I do enjoy when my clients let me have more creative freedom, allowing me to do what I do best! Of course, I'm particularly invested in cultural tattoos or anything that has to do with where someone is from -- tattoos that honor one's ancestry & heritage, whatever that looks like. Do you have any upcoming projects you are excited about? Currently, I'm working on some commissioned portraits for a TED-Talk style event and another commissioned illustration for AIA Seattle and Design In Public for a show titled, "Sanctuary," which focuses on and will present research on how to make cities more welcoming, accessible, and accommodating to immigrants & refugees. Tattoo-wise, I'm so excited about doing my first guest spot at Saved Tattoo in Brooklyn at the end of this month!